"Baking" is nowadays a big trend in makeup. The day I first heard about it the first thought came to my mind is "this is not a cake...then why we bake in makeup? "...lol, I know I am sounding pretty silly. But when I check the internet about it I learned the true meaning of "Baking". The term, which has been used in the makeup community for years, refers to letting translucent powder sit on your face for five to 10 minutes, which allows the heat from your face to set your base foundation and concealer, and then dusting it off your face, leaving you with a creaseless, flawless finish. Founded in 1962, the now legendary RCMA foundation was introduced for makeup artists working in film, television, and stage. Setting it a step ahead of the rest is its manufacturing - hand-poured in small batch conditions to ensure consistency and color standards are matched exactly, it instantly gives a flawlessly even skin tone and texture. We love RCMA's No-Colour powder, earning its status as the ultimate way to set your makeup thanks to its invisible, complexion perfecting finish. 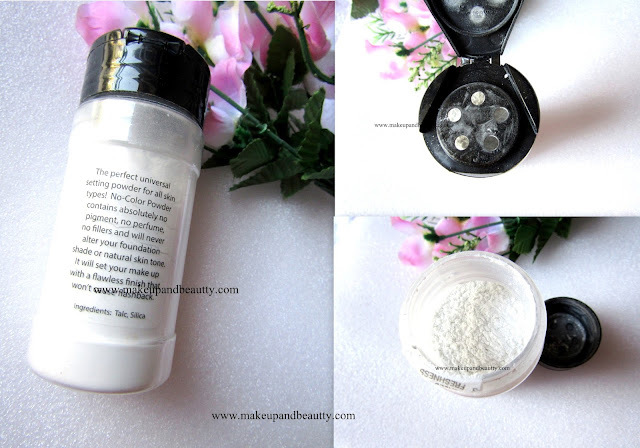 A lightweight, finely milled powder ideal for all skin tones.No-Colour Powder is a unique loose and invisible setting powder. The weightless texture buffs effortlessly into the skin without leaving behind an ashy cast or altering the color of your foundation. Ideal for trends such as baking, the non-caking finish of this professionally developed powder is a must-have essential for making your makeup stay all day. Directions: - Sweep over the skin to set in place your foundation. Price: - Rs.1006.70 /- (according to Beautybay.com)+ shipping extra for 3oz of the product. Available: - Beautybay.com/ Instagram sellers (they are selling in Rs.1500-1800/- ). Now after GST Instagram stores might hike the price. The packaging of this powder is very simple one. It comes in plastic bottle with a flip cap. The flip up cap can be twisted to open the bottle which has the broad mouth. You can either pour the powder directly from the broad mouth of the bottle or with the help of cap which has some small holes in it. The cap actually helps to regulate the fall of the powder. So, in short, you can use it anyway according to your preference. The powder is white in color and has no smell. Now there are so many translucent powders in the market nowadays that you can use any of them to try out this process of "Baking". But I particularly settle into the famous RCMA no color powder. As I wanted to try this out. The powder is fine in texture and it easily blends into the skin. As it is a no-color powder so while applying although it looks white it easily blends into the skin adding no -color looks to your makeup. This powder actually brightens up your makeup. The powder settles into the skin giving a matte finish for hours. It is a perfect powder to set the concealers of under eye area or one can use it to create a sharp contour face look. A little goes a long way. So definitely it is my favorite powder for my makeup setting and I highly recommended this one. So, did you try out this one?